The presumed leadership of the Rill’s Mouth Mine chapter of gnolls, and the source of the attacks on Alfield! Thanks to @spacecaptainz for this art piece! Manticores look like a cross between a sphinx and a javelin-covered porcupine, with an uncannily wide mouth filled with rows of sharp teeth. Evil and unintelligent, wild manticores are willing to hunt in packs of manticores and share their spoils. However, manticores also willing to serve other evil creatures, so long as they are provided with regular prey. Gnolls are already known for their mad desire to kill all human flesh, but until the party got to the final chamber and saw the manticore and her new cub, the dramatic increase in their bloodlust was puzzling. The manacles and chain that the party found after their battle seem to indicate that sort of relationship between the gnolls and the manticore mother. 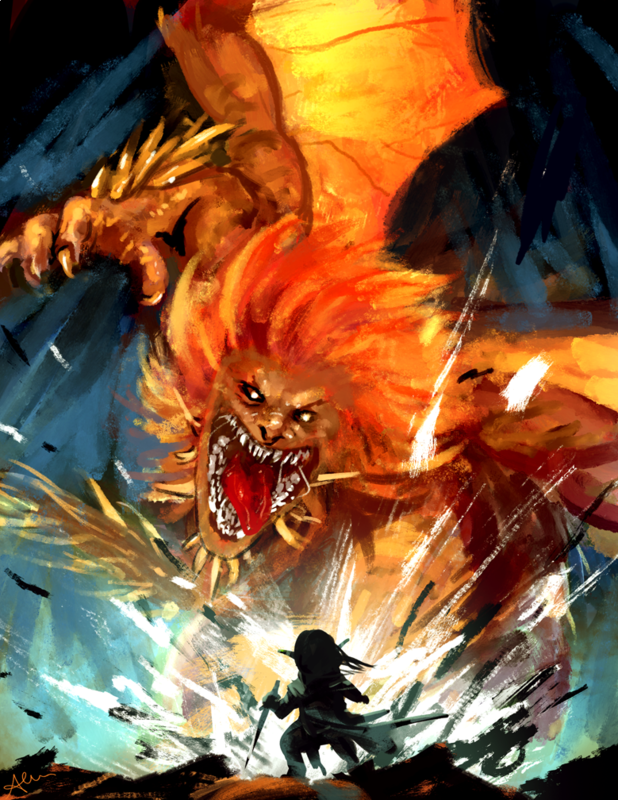 Manticores are a dangerous foe for lower level adventuring parties, getting to either multiattack, claws and bite, or shoot a painful tail spike on its turn. In its battle with our adventuring party, the tail spikes went unused in favor of its bite and claws, even more so when it was enraged. She focused her attention first on Fjord, whose Armor of Agathys dealt an impressive 20 damage when she attacked him. Once he was paralyzed by the priest, she would have likely killed him, had Nott not drawn her ire. Based on the Cult Fanatic NPC block from the Monster Manual (p345), the Priest of Yeenoghu was first seen sacrificing seven hearts to the demon lord (followed by the gnolls and scavenging hyenas) before retreating into the mine. While he had many flowery words in presenting living sacrifices to the manticore, his words did not seem to resonate with the warband’s monstrous patron, who seemed to share no emotional connection to the gnolls otherwise. Regardless, even with an interloper running the tribe’s goals, the priest’s worship of the demon lord had certainly blessed him with divine power, even his personal history and origins remains a mystery. Whether his final words to Beau about “His coming” were the ramblings of a madman or an omen of things to come remains to be seen. With great success, he demonstrated his spellcasting abilities against Fjord and Jester, casting Hold Person and Inflict Wounds against them, respectively. He also carried a dagger, used once only in a failed attack of opportunity against Jester. Mollymauk’s previous Vicious Mockery forced two disadvantages on the manticore, negating a hit and a crit. This kept Nott at 1 HP after a full assault of attacks. Beau pulled Nott away from the manticore. Although Nott fell unconscious, Beau brought her near Jester for healing. Jester fell unconscious to the priest, but the priest failed his concentration check on Fjord’s Hold Person thanks to Shakäste’s Sacred Flame. Fjord rushed in to administer a potion to Jester. Jester stood up, and used her remaining movement to revive Nott. The revived Nott cast Tasha’s Hideous Laughter, disabling the manticore from attacking anyone. The priest would have gotten his turn next, but since he was dead, it opened up Shakäste to lay waste to the manticore.